Michael, the character Zach Braff plays in The Last Kiss, has a pretty sweet life, and he knows it. He’s got a good job, great friends, and a beautiful girlfriend named Jenna (Jacinda Barrett) who loves him and who is carrying their child. But Jenna wants to get married and buy a house, so Michael is getting antsy and nervous about the way his life is not just inching but sprinting toward more responsibility. Wasn’t it just yesterday that he was a twentysomething and didn’t have a care in the world? Now Michael is about to turn 30 and adulthood responsibilities await. So really, it’s no surprise when the young, carefree and beautiful Kim (Rachel Bilson) crosses Michael’s path at a wedding and expresses strong interest in, ahem, getting to know him better, and Michael is tempted to stray. Will he go through with it? C’mon, people, what do you think? It’s SUMMER FRICKIN’ ROBERTS! If I was Michael, I would go with her in a shot. No question. Whoo boy. I likes me some Summer Roberts. A dowdier, pregnant Jacinda Barrett doesn’t even compare. The acting is good across the board, and the various stories all ring true. I know it’s unfair, but it’s hard to watch The Last Kiss without thinking of Garden State, which also featured a small town story, a similarly introspective lead character played by Zach Braff and a younger love interest. 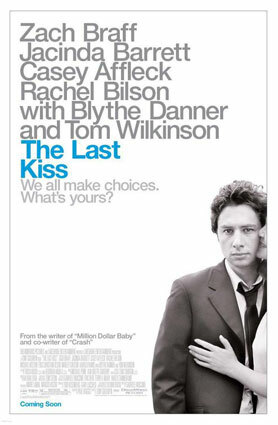 The Last Kiss is a good movie, but Garden State is more entertaining, longer-lasting and has a better soundtrack. I almost hate to make the comparison, but I can’t help it. So in the end, I’m giving The Last Kiss a strong B+. Incidentally, I saw The Last Kiss Tuesday night when it was shown as part of the Boston Film Festival. Director, Ghost star and fellow Brandeis alumnus Tony Goldwyn was there and he answered questions after the film. It’s always cool to get a filmmaker’s insights into the movie you’ve just watched, and Goldwyn shared some good stories about the ending that almost was and how this American film differs from the Italian one it’s based on. Goldwyn also indicated that when the movie was initially being cast, Rachel McAdams was to play Jenna. I think I’d have preferred that casting because, among other reasons, it would have made the central conflict more believable. As it is, Bilson vs Barrett isn’t too hard a choice.